Disclosure: I am compensated for this post by Bing Rewards. 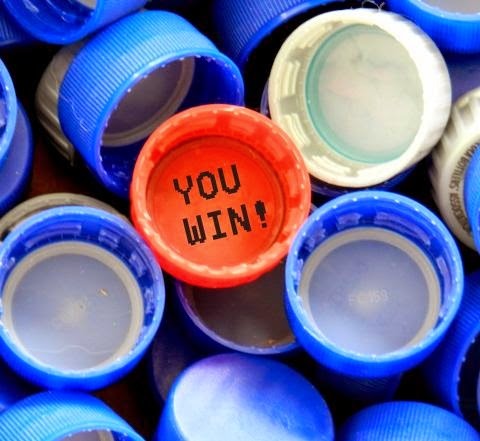 One of my favorite things about the internet is the ease of entering to win sweepstakes and giveaways. I actually started my sweepstakes hobby long before I owned my first computer and I would sit for hours and fill out index cards with my name and address, then write addresses on envelopes, put postage on them and send them through the mail. Now all I have to do is log onto my computer and type out my name and address to win. I enter a lot more sweeps now and I win great prizes on a regular basis. Anything over $100 is a major win in my opinion, so I was really excited to see that Bing Rewards offers major prizes! You already search the internet every day. Did you know you can get rewarded for it? 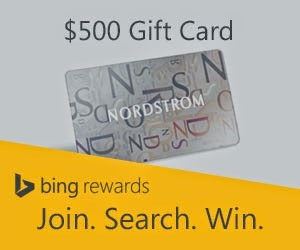 Join Bing Rewards for FREE and earn credits for using Bing to search the web. Redeem credits for popular gift cards, sweepstake entries or charitable donations. Get 20 BONUS CREDITS when you sign in with your existing Microsoft account (Outlook, Live, Skype, Hotmail or Xbox accounts), or create a new Microsoft account. Continue to search every day to earn more credits that can be redeemed for more sweepstakes entries, shopping gift cards, and even donations to charities. There is also a great program called Bing in the Classroom www.bing.com/classroom around how Microsoft is technology to schools with ad-free search, free Surface tablets for classrooms, and digital literacy lesson plans. Through Bing Rewards at www.bingrewardsschools.com, members can donate credits to the school of their choice to help earn free Microsoft Surface tablets! Ready to get started? Join Bing Rewards for FREE and earn credits for using Bing to search the web. Through January 26, 2015, redeem your credits for an entry for a chance to win 1 of 3 $500 Nordstrom gift card. The card has no fee, never expires and is backed by Nordstrom’s long-standing commitment to customers. Kickstart your fashion with a free appointment with a Nordstrom Personal Stylist. Get 20 BONUS CREDITS when you sign in with your existing Microsoft account (Outlook, Live, Skype, Hotmail or Xbox accounts), or create a new Microsoft account. Click on the Nordstrom sweepstakes banner. Click on the blue REDEEM button to be entered! Continue to search every day to earn more credits that can be redeemed for more sweepstakes entries, shopping gift cards, and even donations to charities. Now, as I search the internet for sweepstakes to enter, I use Bing and earn rewards to enter (and win) even more fabulous prizes. What would you buy with a $500 Nordstrom Gift Card? Get started today by joining for free HERE! If you are hosting giveaways, link them up below. If you love winning prizes, enter the giveaways below. 'Tis the season for coughs and sore throats! I have mad seasonal allergy reactions to cedar and mold, so January in Texas is a bear for me. This month, I've been trying out Pine Brothers Softish Throat Drops, a product that's new to me. Pine Bros is a premium throat drop brand that dates all the way back to 1870. Widely known as America’s original throat drop, their rich history, all natural ingredients, and unique “softishness” make Pine Bros a favorite among many. Pine Brothers Softish Throat Drops come in Licorice flavor, Natural Honey flavor, Lemon Citrus flavor, and Wild Cherry flavor (my personal favorite). They can be purchased in bags or in pucks, which is a little round container that fits nicely into my handbag. Pine Brothers is available now at both Walgreens and Walmart. I really like Pine Brothers Softish Throat Drops. They help to ease my throat pain from coughing and they taste good too. The recipe has been unchanged for 140 years, with the soothing natural qualities of plant glycerin and the healing properties of gum acacia in each throat drop. Try them! Learn more about Pine Brothers at www.pinebrothers.com. Follow them on Facebook, Twitter, and Pinterest, then enter below to win a variety package of 12 bags/pucks of Pine Brothers Softish Throat Drops! Did you make a New Year's resolution to be more crafty? More careful with your money? More deliberate with your creations? The Paper Pumpkin craft kit for January covers all those resolutions! This month's kit, All Shook Up, contains everything you'll need to create nine beautiful occasion cards. Paper Pumpkin is a monthly subscription craft kit, created by Stampin' Up!, that teaches you step-by-step (via an instruction book and online video tutorial) how to create many different kinds of paper crafts. Each month's kit is different, and includes the supplies required to create that month's project. The All Shook Up kit is so much fun! It includes supplies for making nine cards that feature a shaker box on the front, filled with sequins and confetti. This Paper Pumpkin kit includes six stamps for Hello, Thank You, and Happy Birthday events, plus an ink pad. It also includes 3D foam strips, frames, plastic sheeting, and sequins for creating the shaker boxes. There are also multi-colored sheets of pre-cut stars in gray, blue, green, and pink, plus a tiny toothpick to press the stars out to make confetti for the shaker boxes. There are also three sheets of pre-cut sayings that are sticker-backed so it's easy to adhere them to the front of the shaker box on the card. The kit also includes nine pre-scored greeting cards and nine envelopes. I've found that the Paper Pumpkin craft kit instructions are always clear and easy to follow. I've also found that all the supplies are high-quality and in perfect condition when they arrive in the mail. It's such a joy to learn how to do something new and I love to bless others with the things I make from my kit. In about 30 minutes, I created all nine of my occasion cards, with minimal mess and maximum fun. They were easy to make, but look absolutely beautiful and I can't wait to share them! I highly recommend Paper Pumpkin craft kits and encourage you to sign up for their monthly subscription boxes. You'll save money because you only receive what you need to create that project and you'll be pleased you made something you're proud to give. Visit Paper Pumpkin HERE and sign up! Be sure to enter below to win the All Shook Up kit! Win a Paper Pumpkin Craft Kit! To enter, just fill in the contest form below. Giveaway is open to US residents, ages 18 and older. 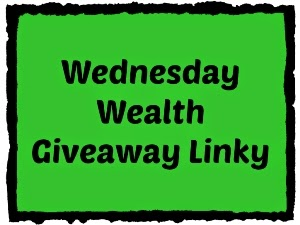 Giveaway ends on 1/31/2015. Good luck!